4 ways to appear more confident, even when you have shrimp emerging from your eyes and mouth. We all know confidence is important. Confident people are more successful, appear more attractive, and report themselves to be happier overall. But confidence can be hard to get, especially if you have two or three giant shrimp coming out of your face. So here are 4 quick tips, promised to improve your confidence. Studies show that out posture improves when wearing new clothes, even if our faces are essentially giving birth to multiple shrimp. And those with good posture appeared more confident to 87% of the people we polled. People are less impressed with the clothes than with what the clothes do to the person wearing them! It can be easy to think things like “Everyone can tell I have shrimp coming out of my face” but remember that these are just illogical thinking traps. We can’t read minds*, so we can’t know what others are thinking. Most people are too concerned with their own anxieties to notice things like the 13 inch long crustaceans flailing violently as they try to free themselves from the openings in your skull. 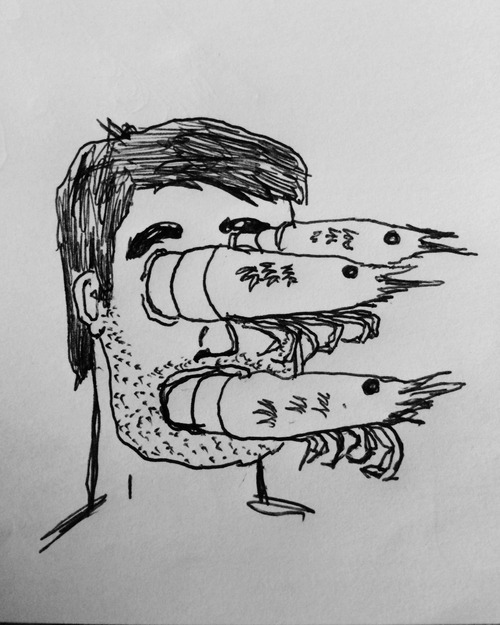 We tend to morph into the people around us, much like the way your shrimp morph into full-sized adolescent hivestalkers once they’ve fallen from your face, chewed through their umbilical cords, and skittered away into water. Read biographies of successful people, choose your friends wisely, and try keeping a photo of someone you admire in your wallet! We know we can’t believe all the negative things people say while discrediting the positive. So why do we do it? When people say things like “You look nice today!” or “Shrimp? What shrimp? I-I don’t see any shrimp!” while scrambling away on raw hands and knees, why do we assume they’re just being nice? By learning to receive praise, we can begin to recycle that praise into confidence, just like the shrimp recycle your brain matter into eggs. And just as shrimp eggs surely lead to more shrimp, confidence will surely lead to more confidence.